…a testament to a thriving — and growing — local beer scene. For Kroner, BeerFEST “is a way to thank our loyal customers — who drink a lot of New York craft beer –and to show our support and commitment to local food and drink.” The event’s popularity — advance ticket sales had to be curtailed this year — has outgrown the current location; next year it will take place at a larger venue in the area…stay tuned. 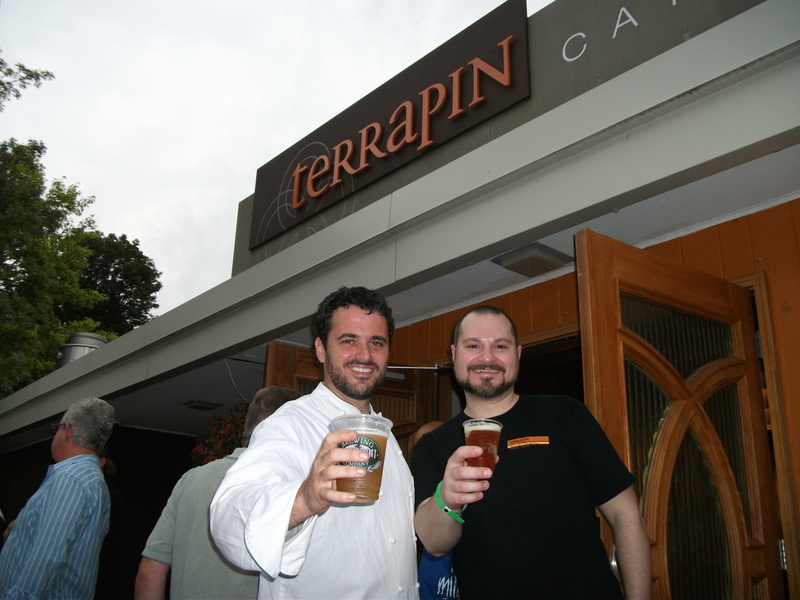 Terrapin does walk the New York craft beer talk. 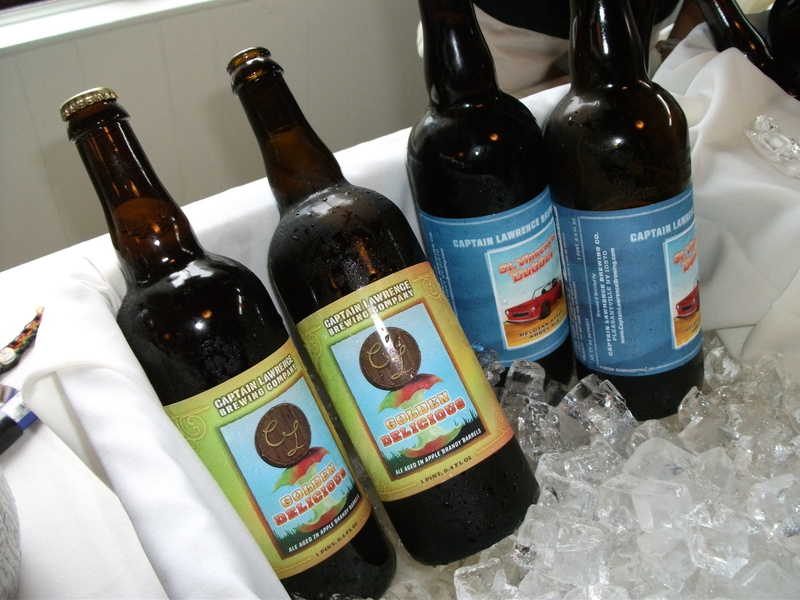 When it opened in Rhinebeck back in 2003 , only one of its ten beer taps was from New York (Brooklyn Brewery), and only one brewery, Ommegang, was represented in bottle. Today, up to seven of their 10 taps are New York craft beers (with frequent rotations in and out), and around 20 New York bottled beers grace the extensive beer list. 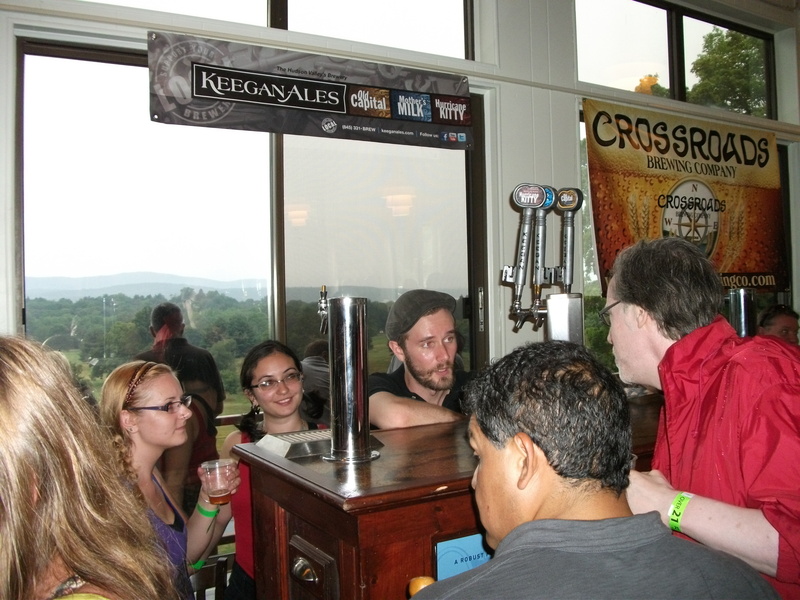 The event featured a great mix of New York State breweries — big (Saranac) and small (Peekskill); older (Brooklyn) and newish (Crossroads [Athens]); upstate (Ithaca) and downstate (Bluepoint [Long Island]). What they all had in common: exceptionally high standards of brewing, and a dizzying array of specialty beers. Take, for example, Captain Lawrence’s “Golden Delicious”, an “American-style trippel ale” (a strong Belgium pale ale), aged in Apple Brandy oak barrels. Fruity and floral with Calvados aromas and a slight tannic bite, this might not be your cup of tea, but it’s unique and well-made, with wine-like complexity. The many pun-rich names of the showcased beers were also a riot, like RastafaRYE, Rosemary’s Baby (a rosemary-infused ale), Farmer’s Tan and Toxic Sludge Black IPA. Unfortunately, without a designated driver, and despite being one of the few to spit and dump consistently, I had no choice but to limit my sampling that afternoon. So, I focused on the classic styles and the breweries’ signature beers (although I did try some of the over-the-top offerings). While Pilsner is a ubiquitous style of lager, especially among macro-brews, great examples are rare. 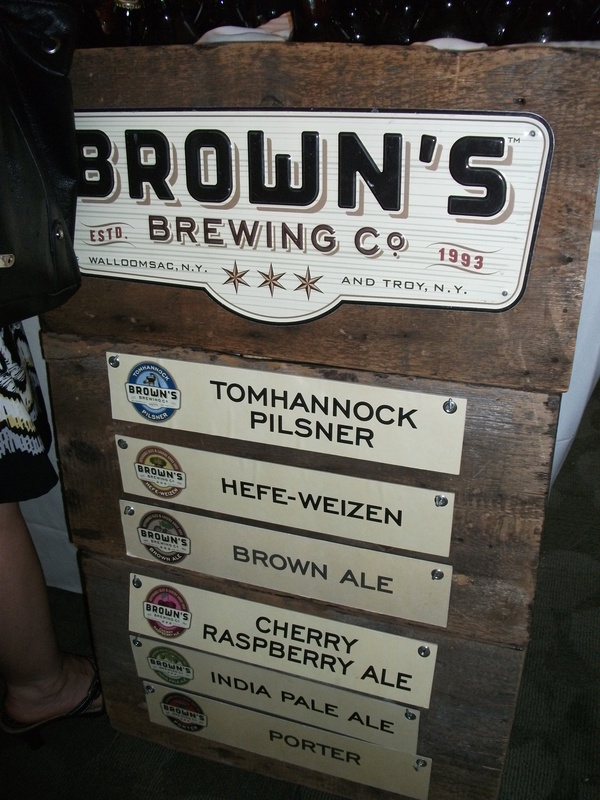 At BeerFEST, I really enjoyed the Tomhannock Pilsner from Brown’s — crisp and bready with a nice bitter-hop finish, Central European style. I was also enamored with Brown’s zesty, fruity, banana-inflected (courtesy the German yeast strain) Hefe-Weizen, and it’s intense, smoky and finely balanced Porter. Also impressive was Captain Lawrence . From its stylistically correct, pleasingly bitter and highly drinkable Kölsch (a light blond, top-fermenting ale), to the wine-like Rosso e Marrone, a “sour ale” fermented with grapes and aged in oak barrels, the Captain puts out some compelling, creative suds. Overall, it was my favorite brewery at the event. Brooklyn Brewery is, of course, familiar, and I’ve had its Oktoberfest seasonal release previously. But this year’s version struck me as exceptional — bright and fresh, with the perfect amount of maltiness, finishing clean. A fine beer for food (think ham and/or Weisswurst). Perhaps Garret Oliver tweaked the recipe? The Sorachi Ace Saison-style ale, named for a rare Japanese hop used in the brew, is also noteworthy: dry, floral and lemony, with great acidity, it’s another one for the table (with soft cheeses)! 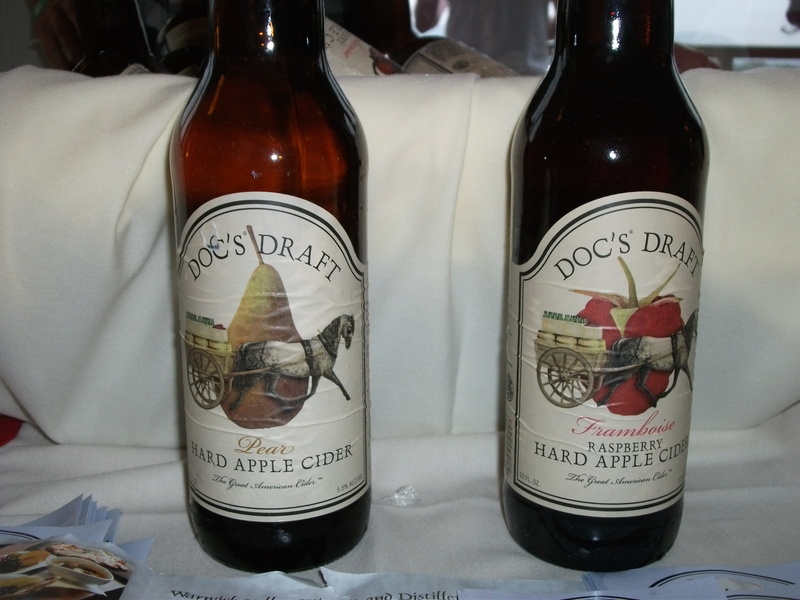 After all the barley and hops, a hard apple cider — Doc’s Draft Hard Apple Cider from Warwick Valley, in fact — was just the thing to refresh the palate. Earthy, vinous and effervescent, this is a lively, quality cider full of nuanced apple flavors. Ommegang’s Ommegang Ale — the award-winning, Belgium Abbey-style ale: smoky, slightly sweet with cocoa hints and excellent balance. Keegan’s “Joe Mama’s Milk” Stout — intense coffee roast aroma, and highly drinkable. Southampton’s Saison Deluxe — a true Belgian-style farmhouse ale, fruity, dry and nicely hopped. One for the (Thai) dinner table. And for the hop-heads out there: Keegan’s Hurricane Kitty (IPA) and Southern Tier’s 2X IPA deliver beaucoup hops, but remain quite sessionable. 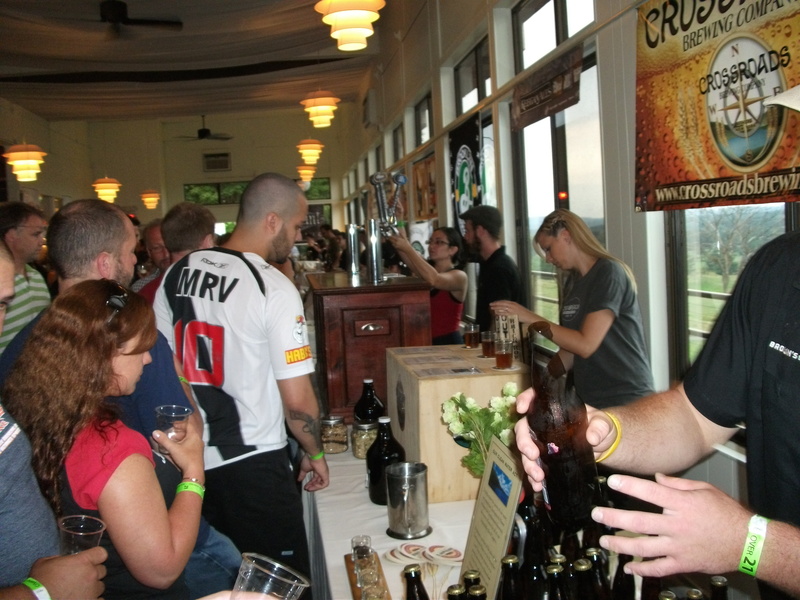 Noting the capacity crowd at BeerFEST, I also learned that a number of breweries — Captain Lawrence, Browns and Peekskill, among others — are expanding production, a sure sign that New York craft beer and quality local suds have arrived. This entry was posted in Beer + Cider, Hudson Valley, Restaurants and tagged Brewery Ommegang, Brooklyn Brewery, Brown's Brewing Company, Captain Lawrence Brewing Company, Doc's Hard Apple Cider, Josh Kroner, Keegan Ales, NY Craft BeerFEST, Terrapin Restaurant. Bookmark the permalink.